These vents provide hot air escape from the chassis for cooler underhood temperatures which helps to maintain higher horsepower. The left side vent helps to keep the clutches running cool, which considerably reduces the chance for performance loss due to heat saturation and improves belt life. The right side helps reduce underhood heat given off by the exhaust system for a more consistent running engine. Vents utilize a powder snow pre-filter that repels snow and water, yet allows air to pass right through it. Sold as a kit, includes one right and one left side vent. This High Flow™ Air Intake Kit substantially reduces air box restriction for more airflow to your engine, which improves throttle response, peak horsepower and running consistency. A good improvement for stock sleds, mandatory for modified ones. 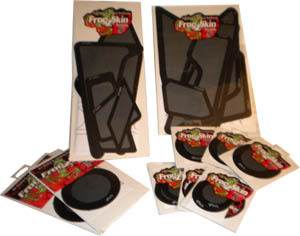 This new Footwell Vent Kit helps to effectively remove hot underhood heat from the chassis. These vents considerably reduce the chance for performance loss due to heat saturation for a more consistent running engine. They are installed just above the footwells and are sold as a set, one right and one left hand vent. This new High Flow™ Intake significantly increases air intake surface area for better airflow to the engine. It provides additional air in a protected location on the dash to help prevent plugging in deep snow. This new Powder Snow Prefilter kit for Polaris 900 RMK and Switchback increases intake surface area for increased performance. It also eliminates the stock foam filters that often fall out and get lost. The prefilter securely fastens to the hood to provide a more positive seal for improved cold air intake with less chance of snow ingestion through the intake vents. This kit features an attractive brushed aluminum grate which utilizes a special pre-filter material that repels snow and water, yet maintains high air flow. The stock air intake of the new Summit Rev is known for plugging when running in powder snow conditions. Eliminate this plugging problem with the SLP powder snow pre-filter. This unique material repels powder snow and water while passing air right through. A must for anyone riding in powder snow conditions. 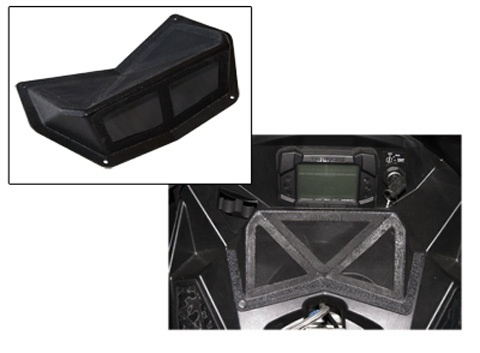 This High Flow Intake Kit for the Ski-Doo XP increases the air intake surface area by 33% to reduce the chance of the intake plugging in powder snow conditions. It is located higher than the stock intake and within reach of the rider so that any snow that collects on it can be easily wiped away. This kit consist of a molded plastic adapter that seals between the stock air box and the hood along with an intake grate that utilizes our pre-filter material that repels snow and water while passing air right through. This kit is a must for anyone riding powder snow conditions. The REV is in desperate need of additional chassis ventilation to eliminate unwanted underhood heat build up. This kit effectively forces cold air into the chassis via two Flow-Rite™ Intake Kits located in the rear of the shock tower. It then evacuates the hot air out of the chassis via an attractive brushed aluminum outlet grate. The outlet grate utilizes a powder snow pre-filter to eliminate powder snow build up or ingestion. Hot Air Elimination kit includes; Air Outlet Grate and (2) Flow-Rite™ Intake Kits. 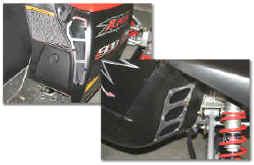 The REV's stock air intake is restrictive and because of its placement it is prone to plugging with powder snow and ice. This results in a significant loss in horsepower which makes the sled very inconsistent when running in deep snow conditions. This High Flow™ Intake kit corrects these problems by providing more than double the intake surface area for added air flow to the engine. Its placement as well as its design, which utilizes a powder snow pre-filter that repels snow and water, which reduces the tendency of powder snow and ice plugging by shedding the snow rather than allowing it to build up. SLP Hot Air Elimination Kits help reduce stagnant underhood hot air to maintain higher horsepower by delivering additional cold air intake and hot air escape from the chassis. This kit includes one shock tower air inlet vent, an upper side panel air vent, and one outlet vent. Each vent utilizes a powder snow pre-filter that repels snow and water, yet allows air to pass right through. SLP Hot Air Elimination Kits help reduce underhood hot air to maintain higher horsepower by delivery additional cold air and hot air escape from the chassis. The kit for the left side helps to keep the clutches running cool, which considerably reduces the chance for performance loss due to heat saturation and improves belt life. The kit for the right side helps to reduce underhood heat given off by the exhaust system. Vents have a powder snow pre-filter that repels snow and water, yet allows air to pass through. These vents are sold in kits for the right and left side. 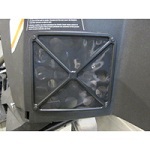 Each kit contains one air inlet grate, on outlet grate, required fasteners and detailed instructions. SLP Hot Air Elimination Kits help reduce stagnant underhood hot air to maintain higher horsepower by delivering additional cold air intake and hot air escape from the chassis. The kit for the left side helps to keep the clutches running cool, which considerably reduces the chance for performance loss due to heat saturation and improves belt life. The kit for the right side helps to reduce underhood heat given off by the exhaust system for a more consistent running engine. Vents utilize a powder snow pre-filter that repels snow and water, yet allows air to pass right through. These vents are sold in kits for the right and left side. 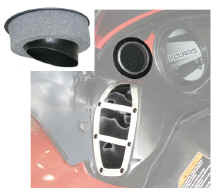 Kits include a side panel vent and two Flow-Rite™ Intake kits. This High Flow™ Air Horn Intake kit delivers more air volume into the airbox improving atomization efficiency of fuel in turn improving throttle response and providing additional horsepower. A good improvement for stock sleds, mandatory for modified ones. This new 4” pre-filter was designed to replace the speedometer or tachometer to allow more cold air flow into the intake tract for more air box feed. Made with a powder snow pre-filter that repels snow and water, yet passes air right through. 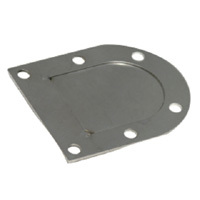 Requires 4 1/2” hole for installation. Can also be used on any flat surface for custom applications. Eliminate air intake restrictions by installing the Flow-Rite™ in the dash or intake tract for more air box feed. The Flow-Rite™ is supplied with a powder pre-filter that repels snow and water, yet passes air right through. A must modified sleds. Sold per each. 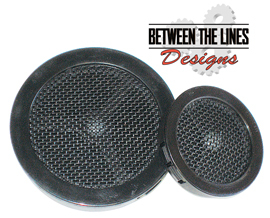 These universal SLP Powder Snow Pre-Filter are perfect for custom intake areas on many modified sleds. They work extremely well in areas that are exposed to airborne powder snow. This unique filter repels snow and water yet passes air right through. Please email to check current stock.